When my cousin Laura urgently texted me that I absolutely had to grab "the best book she's ever read," I had my reservations. Laura tends to exaggerate (she once called to tell me the best movie of the year was Leap Year) but she's genuinely earnest in her recommendations. Note: her exaggerations lend to the funniest dinner table stories you will ever hear. 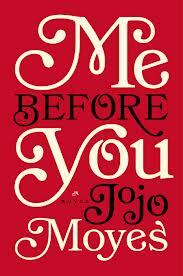 I heard about Jojo Moye's Me Before You before she referenced it, so I curiously went over to the nearest bookstore that day to purchase it. I texted her while in line, this better be good. Fast-forward barely a week later, and my texts went from skeptic to believer. I found myself staying up late to read, and eagerly waiting to get back to it. The book tells the story of Lou Clark, a sheltered homebody with a seriously boring boyfriend and small town family who becomes the caretaker of paraplegic Will Traynor. Will used to be a high-powered, adventurous businessman until an accident changed his life. Oh, and don't ever watch Leap Year. I am reading it now, also because of Laura's Instagram photo of the book! Loving it so far! This was an incredible story that was so painful (in that crazy heart hurting kind of way) to read but I simply could not put it down. Me Before You is a heartbreaking story about finding what makes life worth living and making the decision whether it's truly enough. Definitely a new favorite and one that my heart won't be forgetting any time soon. The characters are likable, and its very obvious the author did her homework with regards to subject matter. She created a heartwarming story that will be with you long after the book is finished.